Trying to find a Leaky Pipe is a Little Like Opening a Can of Worms… You just don’t know what problems are hidden behind the walls or ceilings. A leaky pipe or faucet can be annoying with the sound of constant dripping and buckets full of water that need to be emptied. 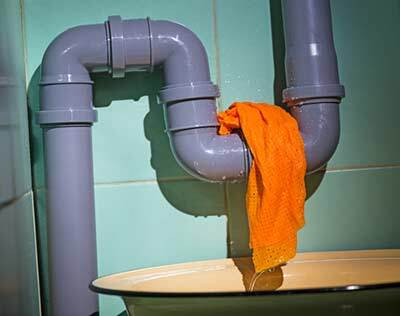 A small leak under your kitchen sink may seem like a manageable problem but, It is unsettling when you have to deal with leaking pipes due to deterioration of old piping, faulty products and improper installation knowing a disaster can happen at any time. Worst cast scenario is a pipe bursting when no one is home causing water to flood for hours. This is why it is important especially in older homes to call a professional at the first signs of trouble. To fix the leak, a plumber often must tear out the drywall, requiring someone to patch and paint the wall when the plumber is finished. Do you have a leak that you can’t locate? We can help… At DJ Plumbing & Heating we have seen the damage that happens to drywall, ceilings, floors and fixtures when the water leak is tough to detect. A small stain on your ceiling could be coming form a dripping pipe from any number of areas. If you can’t find the leak or the leak is inaccessible without serious demolition it is time to call a professional. It is a wise decision, considering a small leak can easily turn into a flash flood and if left unattended can cause costly damage to your property and your belongings. Musty or earthy smell: You may smell the effects of a leak before you see obvious signs of problems. Mold thrives on moist, dark areas, and a pipe, which is typically hidden in a wall or under flooring, provides the perfect starting point for mold or mildew if the pipe springs a leak. Stains on ceilings: If you have a bathroom on a second floor that has a problem, you might spot a leak, or brown or copper stain in the ceiling beneath the bathroom. However, because water can travel a long distance, it’s possible to find water stains on the ceiling farther away. A sagging ceiling is a definite sign of water issues and should be investigated immediately. Damaged walls and paint: A wall with bubbling drywall or paint is another sign of a troublesome leak. When water and moisture get into the walls and behind the layer of paint, it eliminates the bond and begins to separate the two, causing the paint to rise from the wall and shed off. When drywall is exposed to moisture, it becomes soft and begins to blister, ultimately warping and breaking into pieces. Damaged flooring: If parts of your floor are starting to showing signs of buckling, cracking or beginning to stain for no obvious reason, chances are hidden water damage is the culprit. Depending on the type of flooring moisture can make it feel spongy or soft. Tile may lose its adhesion and become loose, allowing you to easily remove a piece and possibly expose water or moisture underneath it. At DJ Plumbing & Heating we are professionals that can handle all types of major and minor plumbing issues. Whether a small leak shows itself under your kitchen sink, or your property has had may problems with its old piping system, our expert staffs is able to determine were the water issues may be coming from and can advice you on the best way to fix them. We serve areas around the Lower Mainland such as Vancouver, Burnaby, Tri-Cities/ Coquitlam, Port Coquitlam, Port Moody, Pitt Meadows, New Westminster, North Vancouver and West Vancouver. Get in touch with DJ Plumbing & Heating by phone 778-227-1119 or email info@djplumbing.ca to get an estimate on the plumbing services we offer in Vancouver and across the Lower Mainland.